SALMON ARM, B.C. — Whether you’re on the left or right is a common distinction in the political arena, but what about which lane trucks should be relegated when passing through town? Shuswap resident J. Edgar Murdoch penned a letter to the B.C.’s Ministry of Transportation requesting the government consider erecting signage along the Trans-Canada Highway through the City of Salmon Arm directing commercial trucks into the far left lane when passing through town. Murdoch points to Nevada capitol Carson City as a successful example of an urban community that takes this approach, saying all through trucks are relegated into the far left lane of Hwy 395 when entering the city limits from either direction. “Traffic moves smoothly, there are few interactions between vehicles, frustration is reduced to near zero and life is good,” Murdoch writes in his letter to the ministry. Murdoch contends that the vast majority of traffic conflicts occur between vehicles, cyclists, and pedestrians in the right hand lane due to vehicles turning off the highway, entering the highway, stopping, starting, and pedestrians and cyclist maneuvering in the area. Murdoch’s driving experience includes 67 years in transportation, 50 of them on the road and 10 as a safety officer. He says because the Trans-Canada is the main street of many communities across Canada, there are several common and unique obstacles to the safe and smooth movement of traffic, which includes everything from passenger vehicles, cyclists, pedestrians, and large semis. Murdoch’s idea, however, is not on the City of Salmon Arm’s radar. Robert Niewenhuizen, director of engineering and public works for the city, said the idea of directing commercial traffic is not one that has been brought to their attention. On the contrary, he said a more common practice is the have commercial traffic stay in the far right-hand lane. Niewenhuizen contended that typically the practice is that slower traffic keep right and the far left lane is for passing, and a change could be confusing for drivers. 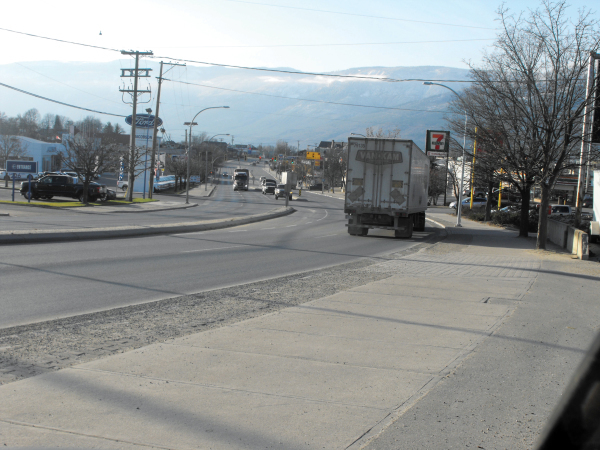 The City of Salmon Arm and the province are planning several improvements along the Trans-Canada in the downtown corridor next year. One improvement includes the relocation of the traffic signals from Ross Street and the Trans-Canada to Fourth Street and the Trans-Canada. An open house was held May 25 to highlight the proposed Trans-Canada corridor safety improvements in Salmon Arm.